Book Club: Friday, April 12, 1pm, Lounge. Claudia Circle will meet Thursday, April 4, in the lounge at 1:00 pm. This women’s group hosts a variety of monthly program speakers. New members are always welcome! At this meeting, St. Paul’s Episcopal Nursery School Director, Eileen Sharbaugh, will present an overview of the school’s history, current program offerings and the new Matt’s Maker Space. All are invited to spend an afternoon sharing in fellowship with church members and friends will learning of our outstanding preschool serving the South Hills. For more information, contact Sue Vines at [email protected]. Get Mindful with CLASP (Church Ladies At St. Paul’s) Thursday April 11, 7pm - Parishioner Aimee Lamendola will introduce and lead a Mindfulness session. Mindfulness is the basic human ability to be fully present, aware of where we are and what we’re doing, and not overly reactive or overwhelmed by what’s going on around us. While mindfulness is something we all naturally possess, it’s more readily available to us when we practice on a daily basis. One goal of mindfulness is to wake up to the inner workings of our mental, emotional, and physical processes. Please feel free to invite others! RSVP not necessary but helpful!. Contact Eileen Sharbaugh at [email protected] with questions. Newcomers’ Reception: Sunday, April 28 at 9:45am, Lounge St. Paul’s is honored to welcome ALL who are new to, or exploring, St. Paul’s to a Newcomers Reception. Come and meet new faces and learn about worship, music, outreach, children and youth programs and all of the other great ministries and activities that make our church a special community. We are blessed with your presence and hope you’ll plan to attend. Children are welcome! If you’d like to attend, please contact Barbara Galderise, 412-874-6446, [email protected]. 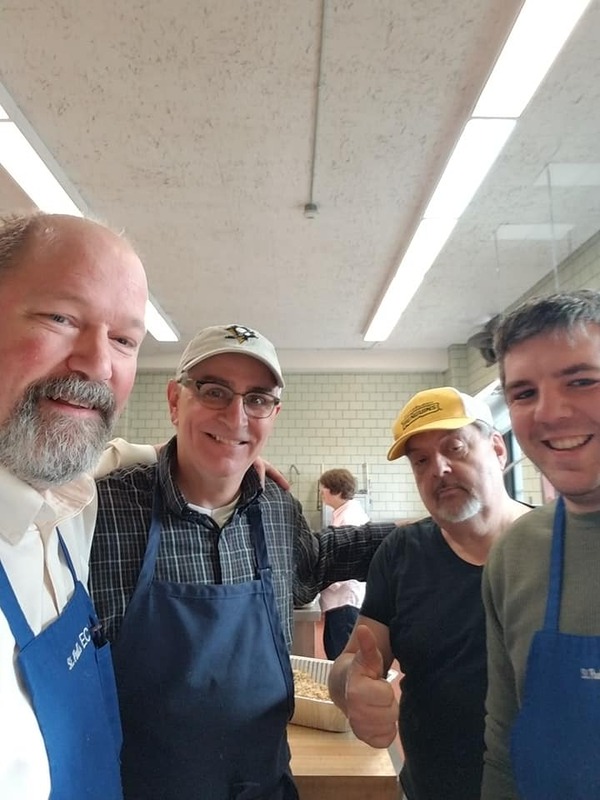 Agape Feast 2019 – April 20 The Community Life and Fellowship Commission is happy to host the Agape Feast this year following the Easter Vigil service at Old St. Luke's. You are all invited to make the short commute from Old St. Luke's back to St. Paul's. The CL&F Commission will provide a Mediterranean spread of grape leaves, hummus, cheese plate, etc. Please bring a beverage of your choice. RSVP with Karen at the Donut table, or email Garrett at [email protected]. A minimum of 20 RSVP's for this event to go forth. Due to limited sexton availability, those present will be responsible for cleanup. Contact Garrett with any questions. Pickwick Boys: Thursday, April 18, 2019, Mitchell's Fish Market, noon. Join a group of (mostly) retired St. Paul's men for lunch, and fellowship! To RSVP, or if you have any questions, contact your host Chuck Koval at 412-653-4631. Dickens Dames: Thursday, April 25 at 12:30, Olive Garden. Join a group of (mostly) retired St. Paul's women for lunch, and fellowship! To RSVP, or if you have any questions, contact your host Paula Gerstenberger 412-343-3096 with any questions.